For the backpacker who can afford to purchase an ultralight tent and who doesn’t mind compromising on space (and therefore also a measure of comfort), the Mountain Hardwear Ghost UL 2 offers a well-made, viable option for a double-wall two-person tent. For backpackers intent on lightening their loads, reducing shelter weight is often a priority. Weight reduction almost invariably means a push-and-pull among item characteristics: if quality is maintained as weight goes down, cost generally goes up. Given these variables, one’s challenge is to reduce weight without skimping on safety or comfort. 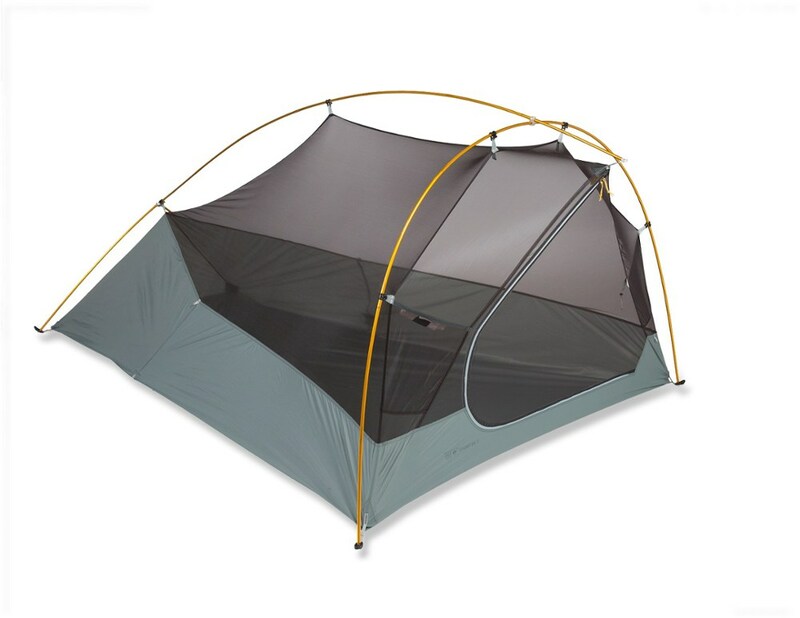 This is where a tent such as the Mountain Hardwear Ghost UL 2 enters the picture: it offers shelter that packs simply and small, that offers a reasonable measure of amenities, and which provides solid protection from the elements—all in a feathery light 2 lbs. 6.4 oz/1.089 kg package with tent and fly, cordage, stakes, poles, and storage bags, (actually lower than Mountain Hardwear’s claimed pack weight of 2 lb 9 oz / 1.16 kg). 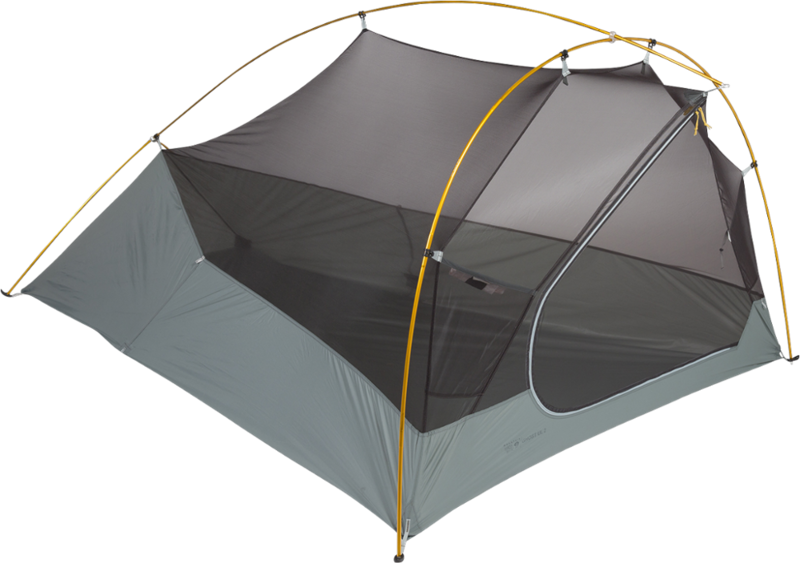 As is often the case with similar shelters in this category, these heady benefits come with a higher price tag—a MSRP of USD $449—more potentially fragile materials, and less interior room. What follows below are discussions about Design and Specifications, Setup, Testing Conditions, Positive Impressions, Potential Limitations, and Conclusions and Considerations. Feel free to scroll down if you wish to skip a section. 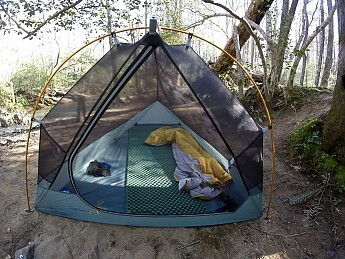 The Ghost UL 2 is a two-person, double-walled tent comprised of two parts: an internal, freestanding tent (basically a bathtub-style nylon/polyamide ripstop floor with no-see-um mesh canopy, all framed by DAC Featherlight poles); and a fully taped nylon/polyamide ripstop fly that requires staking out to be held properly in place (thus not completely freestanding, despite Mountain Hardwear’s UL 2 webpage assertion of “truly free standing light weight geometry and design,” or its suggested use by the “fast-moving backcountry adventurer seeking an ultralight, freestanding, full-coverage shelter” ). 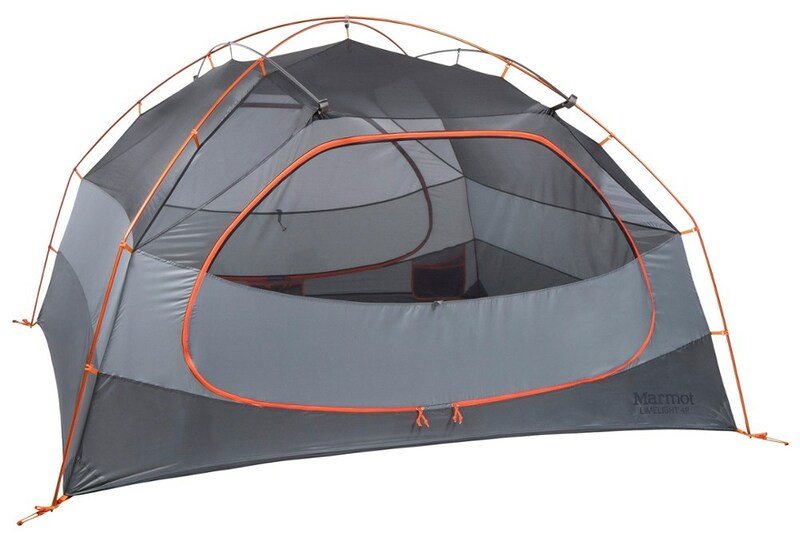 The side that contains the single door (28 in/ 71.1 cm) is 56 in/ 142.2 cm wide, a width intended to accommodate the breadth of two grown adults, lying shoulder to shoulder, on the floor of the tent. 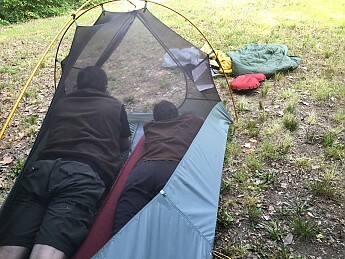 The opposite end, 87 in/ 221 cm away, is a scant 35 in/ 88.9 cm, so one has only one option for sleeping orientation when using the tent as a two-person shelter: heads to the entry. 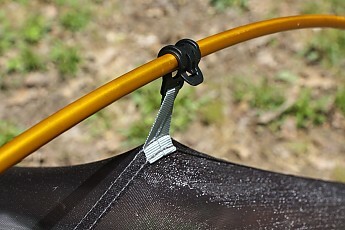 The fly secures to the front pole via a clip (see image, below) and to the black "Jake's Foot"-style clips on the tent corners via plastic toggles on Lineloc-adjustable lines. This creates a triangular vestibule at the entrance which Mountain Hardwear claims is 7 sq ft/ .6 sq m (see second image, below). A cord lock allows one to secure the vestibule open in sunny weather (see third and fourth images, below). 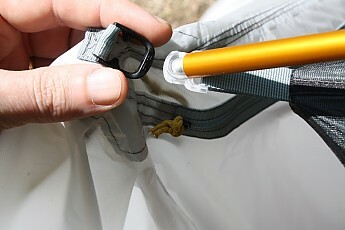 Button hooks on nylon straps on the interior of the fly connect to the exterior middle sides of the tent, and consequently—when the fly guy lines are tightened—the interior walls of the tent are pulled taut, increasing interior space and discouraging sagging of the tent side walls. A second, longer set of guy lines is provided, presumably to increase the distance one can stretch out the fly (I say presumably because no directions were included with this review sample). Finally, seven stout aluminum stakes are included as well as a piece of oversized pole that can be used to reinforce a broken pole should need arise. 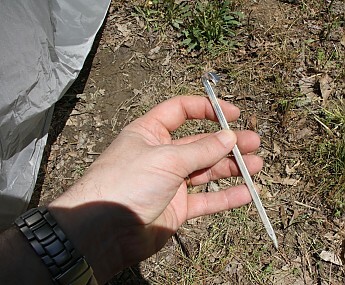 A word on the stakes: one would normally set up the tent with seven stakes—four in the corners, two on the side guy lines, and one to secure the peak of the vestibule—but the addition of two more stakes greatly improves the tent’s geometry by allowing one to secure both the sides of the inner tent and the guy lines of the fly separately. 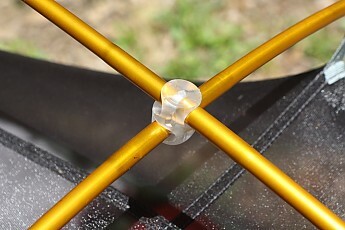 Without these stakes, one is forced to secure side guylines and inner tent sides with the same two stakes, a compromise that works but which causes some side sagging. I couldn’t help thinking, too, that one could shave some grams off the total tent weight by replacing the provided stakes with titanium replacements. Setup is a breeze. I timed myself at 6 minutes when working at a leisurely pace. Faced with dying light or an impending storm, a proficient user could throw up the tent much more quickly. First, the inner tent is spread on the ground. The DAC Featherlight poles assemble quickly and intuitively thanks to tapered fittings, interior shock cording, and intuitive design. This was useful, since—yep—my sample did not come with instructions. One circular hub at the foot end of the pole creates a “V” with two short legs going to the rear corners. 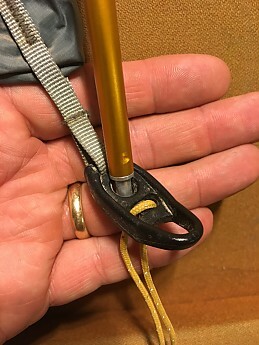 The ridge pole emerges from the opposite side of this hub and extends about a foot past a clear swivel hub connector that holds the pole that will make the inverted front “U” of the tent by descending from the ridge pole to the two front corners of the tent. 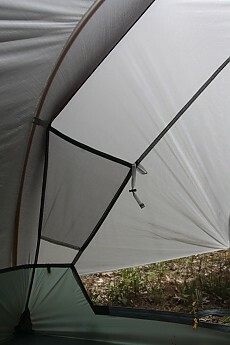 I should note that the freestanding interior design would allow one to skimp on stakes in fair weather conditions—the poles fit into what appear to be Mountain Hardwear’s adaptation of DAC Jake’s Foot connectors, and thus the pole tension holds the tent up. This part of the tent is truly freestanding. However, stakes can be used to secure the four corners (and should be so used in inclement conditions). 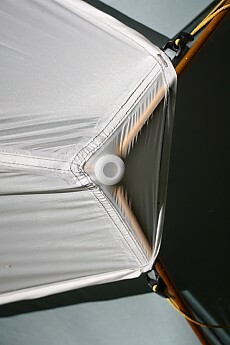 Black clips tension and secure the mesh canopy to the poles, giving the tent its shape. 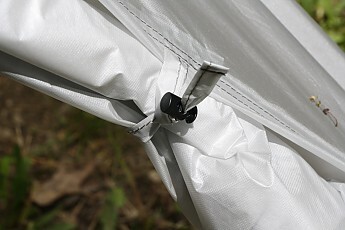 The fly with zipper door covers all, clipping onto the protruding ridgepole at the front and fastening with toggles to the four corners of the tent. It is then adjusted at each corner with Linerloc-style adjusters. 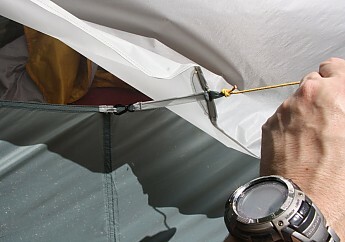 On the sides, button hooks secure the fly to the outer walls of the inner tent, and then staked guy lines stretch fly and tent sides taut. Voila! The Ghost UL 2 is ready for use. I tested the Ghost UL 2 on several trips to the Uwharrie Mountains (North Carolina) from late March to mid-May, encountering temperatures that ranged from a low of 42˚ F/ 5.6˚ C to a high of about 85˚ F/ 29.4˚ C. I set it up on a mixed forest floor, on a damp sand bar by a creek, and in an exposed meadow. I experienced rain and sun. Because of the lighter weight of the tent materials, I also conducted an exposure test of two weeks in my yard to simulate long-term use during which I experienced bright sun, heavy rains (sufficient to provoke an areal flood warning), gusting winds (14-22 mph/ 22.5-35.4 kmh), temperatures as low as 38˚ F/ 3.3˚ C and again as high as 85˚ F/ 29.4˚ C.
Mountain Hardwear claims that the Ghost UL 2 will “deliver solid protection from the elements.” I found this to be true. 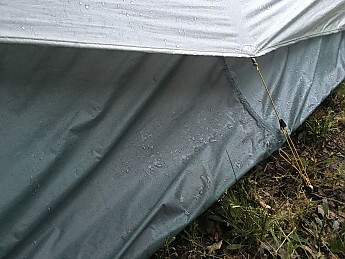 While I did experience some sagging of wet fabric (perhaps caused by stretch in the guy lines as much as the tent fabric), the tent materials effectively kept rain outside of the tent, even in rather extreme circumstances. 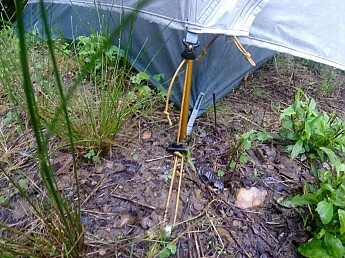 One of my pitching sites was an open meadow that appeared flat, but I discovered during a heavy rain that I had inadvertently pitched the tent in a subtly low-lying area that quickly became saturated with rain and soon had standing water. 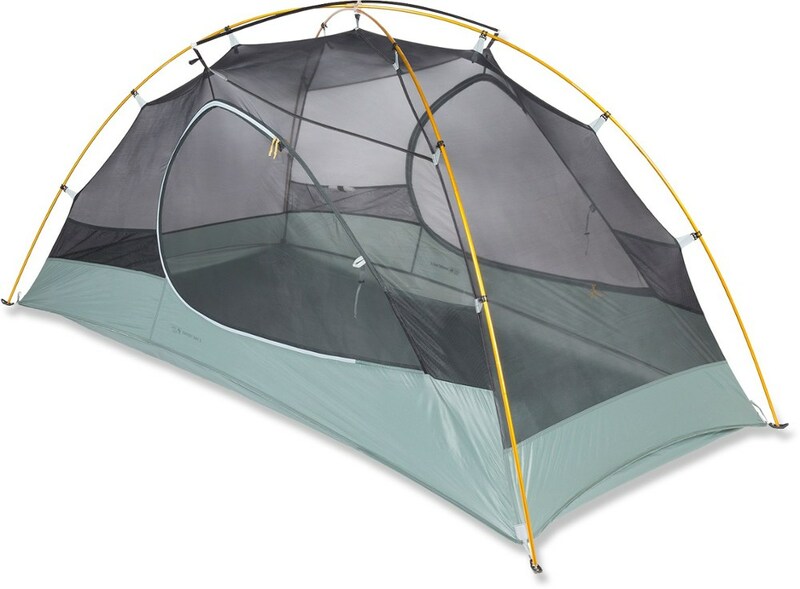 Mountain Hardwear sunnily claims that the UL 2 provides a “dry entry vestibule,” but I had puddling under in vestibule due to water running off the fly and seeping under. 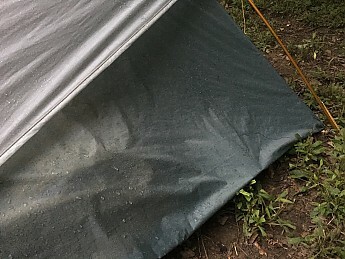 I don’t fault the tent, but with water running off the vestibule’s fly, such seepage—about an inch or two—is a possibility in almost any pitching site under heavy rains. My workaround was to use my Therm-a-Rest LiteSeat as a base for objects within the vestibule during driving rain. 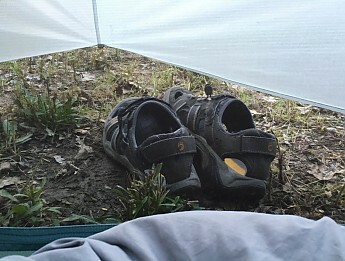 Beneath my sleep pad, I saw the dark presence of water seeping under the floor of the tent, too. Fatigue had obviously misled me in my evaluation of the tent site’s suitability, yet no water came through, a persuasive test of the tent’s waterproofing features and what Mountain Hardwear terms the “guaranteed watertight construction with fully taped fly, taped perimeter seam, welded corners and welded guy clip anchors.” Check. Please note that this tent design does not allow one to pitch the fly first, then erect the inner tent under the shelter of the fly, something to keep in mind if you see clouds bearing down on you. 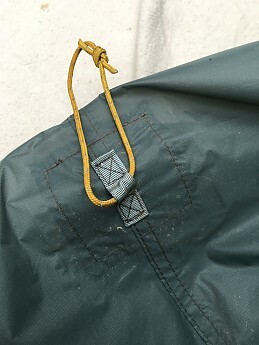 If you have to enter or exit the UL 2 during heavy rain, the front of the inner tent might get spattered from the falling rain when you unzip the fly, though the base is sufficiently high that it is unlikely (except in driving wind and rain) that your gear would get wet due to the overhang on the vestibule. 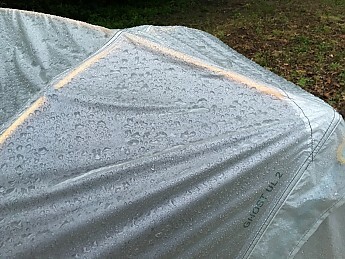 A word on striking a wet UL 2: because the lower "bath tub" portion of the tent is exposed to rain as part of the tent design's compromise in reducing fly coverage (and thus weight), you may be faced with packing both a wet fly and a wet inner tent. I carry a PackTowl Nano for general cleaning/drying, and I found it useful to wipe off rain splatter on the base of the inner tent. Fortunately, a huge benefit of the lightweight fabrics is drying time—they dry in a flash. Just don't let a gust of wind carry them off your line! Wind posed another test for the Ghost UL 2. One night I lay awake, listening to the wind gathering in the trees in the distance, then rushing in awesome but ominous roars through the trees about me. My phone indicated high gusts of wind were expected. Within, the tent walls shivered but held; the only evidence of the gusts the next morning was my need to retighten the guy lines. My multi-week exposure test revealed a possible shortcoming of the tent. The 20D ripstop fly came out of its bag in a beautiful “Grey Ice” color. After two weeks of continuous exposure to sun, wind, and rain, the material had discolored and yellowed perceptibly. Whether this yellowing betokens substantive UV degradation of the fabric or mere discoloration, only time can tell. At present the fly remains flexible and waterproof. My impressions of the Ghost UL 2 were largely favorable. Weight and Bug-free Perks: Often my preferred shelter for ultralight camping has been a tarp, but having a weatherproof, bugproof tent at this weight is heavenly. 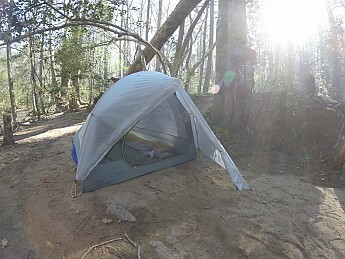 On my first backpacking trip with the Ghost UL 2, I strapped the tent to the outside of my pack because I was carrying gear for my two boys in addition to my own in my decidedly non-ultralight pack (a father’s spring break indulgence of his boys). I had not gone far down the trail when I asked my elder son to check and see if the tent was still in place, so feathery a load was it. I literally could not feel it. I’ve woken under a tarp to find I’m sharing my shelter with all sorts of denizens, from wolf spiders to newts. In the Ghost UL 2, I spent time watching an astonishing array of insects drawn by the glow of my headlamp in the tent, but all trapped outside the the no-see-um mesh. Sweet dreams, indeed! 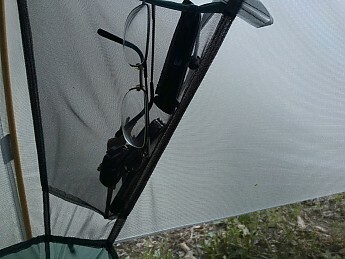 Weather protection and great ventilation: I was cautious when using this tent, wondering if I’d wake to find tent walls dripping with condensation or feel mist settling on my face in a heavy downpour. Instead, I woke to a dry fly and tent walls, even when I pitched the tent on a recently flooded sand bar and when I woke to find water puddling under my tent in heavy rain after my own poor evaluation of tent sites. The most moisture I found throughout all of my tests was a slight gathering of moisture on the bottom of the top ridge pole. Call me impressed. Construction and design: Even as I marveled at the light weight, I wondered about how well the tent would hold up. I was generally impressed by attention to detail and quality manufacturing. There are things I consider essentials like taped seams and welded corners, a smoothly functioning zipper, and simple setup and striking of the tent. But Ghost UL 2 also provides niceties and details that suggest quality construction and thoughtful design: perfectly placed, convenient mesh pockets in the front panel to house keys, glasses, or other essentials (one for each occupant); reflective tabs sewn into the fly and lightweight reflective guy wires with easy-to-use Lineloc-style tension adjusters; reinforced, sealed pull-outs for guy lines; extra, longer guy lines for user inclined to use them. Stitching throughout is neat, tight, and often double-stitched. No edges are left unfinished. There are, however, a few limitations worthy of mention. Awkward entry and exit: At 6’2”/ 1.88 m, I found entry and exit through the 28 in/ 71.1 cm door to be very awkward, requiring me to get on my knees to crawl in. My elder son, who has shot up this summer in height, experienced the same. My fourth grader was far more adept at negotiating the door. The presence of the fly increases the awkwardness for taller people. I had to crawl in, compress my body as I turned around, and then close the door. In the pouring rain, this operation is doubly awkward as one maneuvers to avoid bringing mud or water into the interior of the tent. A limitation? Yes, but one I expect when compromising to reduce weight—as you will see, this theme of most of compromise is universal to all of the limitations I noted. Vestibule size: A tent vestibule is a nice amenity, but the one created by the Ghost UL 2’s pitch is relatively small. It worked great for boot and shoe storage, but I found myself hanging my pack on a tree rather than pulling it into the vestibule (though on that trip I was carrying a heavy pack to accommodate gear for my two boys, too—it wasn’t an ultralight pack). A full vestibule makes entry and exit a bit horrendous, so I can’t really imagine two packs stacked up in this cozy space unless the campers were true ultralighters whose packs were basically reduced to empty sacks by bedtime and tucked to the side to still permit entry and exit. Again, I regard the vestibule size as a compromise enacted to save weight, not a product of poor design. Interior space: Don’t expect lots of room inside. With two adults inside, the tent is very full. Depending on the size of the adults, one might even say cramped. The would-be buyer needs to know this up front and recognize he or she is compromising on room to get the heady, feathery weight. Think through how and where you’ll both stow your kit before being seduced by the weight. I also fretted a bit about how my quilt touched the sloping, exterior walls when I was sleeping. I had expected water to seep through, but I was pleasantly surprised to be dry in the AM. Note: Right-handers may find, as I did, that the need to reach beyond the door opening to zip the vestibule fly shut requires some contortions of the arm and wrist. From the interior of the Ghost UL 2, the door closes from top center to bottom right, which is simple until the zipper moves beyond the door opening. 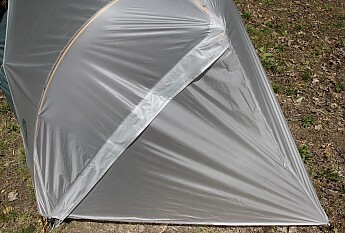 It can be accomplished righthanded, but it requires the right hand to bend backwards to contort around the inner tent’s mesh to fully close the zipper. The no-see-um mesh developed a few pulls in places despite generally gentle use. 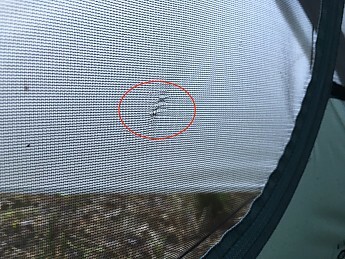 These pulls did not allow bugs to get inside, but might betoken something that could develop into an issue after longer use given that the majority of the inner tent is mesh. I suspect the pulls were caused by clothing catching the mesh at odd angles—perhaps hook-and-loop tabs from my rain jacket—or by my slightly rambunctious son moving gear about and not being fully cognizant of his fragile surroundings. 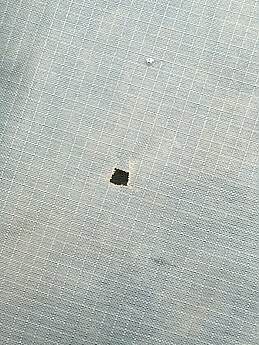 After the two-week exposure test, I discovered a small hole in the floor that was almost exactly the size of one square made by the cross weave of the fabric (in other words, tiny—.057 in/ 1.44 mm). This seems to underscore the limitations of lighter materials. I do not know the cause. The tent was stuck to the ground a bit after two weeks, but this hole almost looks chewed. 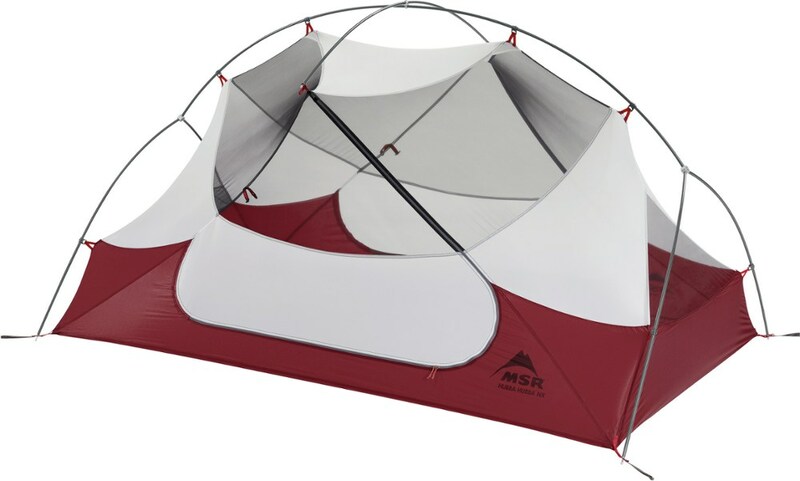 The tent does not come with a footprint (Mountain Hardwear has one available for USD $60), but I think I only would be inclined to pack the extra weight of one if I planned on using the UL 2 for extended use in one location or for use on abrasive sites. 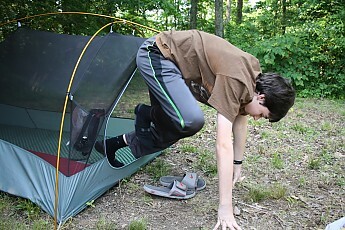 Obviously, the floor is not as durable as higher denier floors one might find in some heavier tents, and a footprint could save wear and tear. 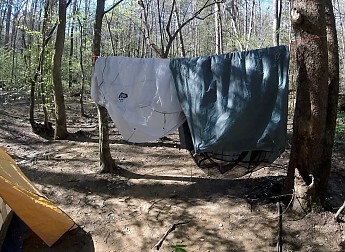 I actually made due with a cheap Ozark Trail 5x7 ft/ 1.52x2.13 m nylon tarp as a footprint one night when I camped on a damp sand bar by a creek--it worked fine. Discoloration: As I mentioned above, the two-week exposure test also produced discoloration of the fly. 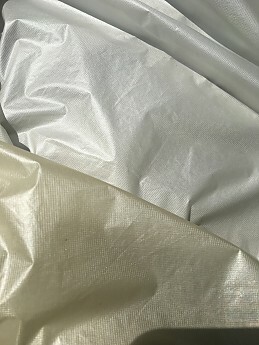 If this is indicative of actual UV degradation, this could shorten the lifespan of a costly tent, something one might wish to weigh if one camps often in areas of intense or frequent sunlight. 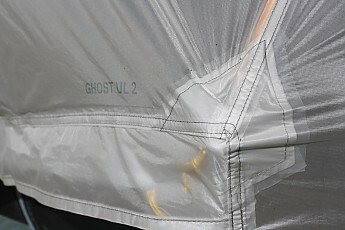 I found the Ghost UL 2 to be a well-made and well-ventilated, waterproof, bugproof, lightweight shelter. If you’ve been meticulously recording the weight of each particle of your gear for some time, always shaving unneeded ounces or grams, and you’ve decided to bite the bullet and can afford the pricy USD $449 price to reduce your total weight, the Ghost UL 2 is worth considering. 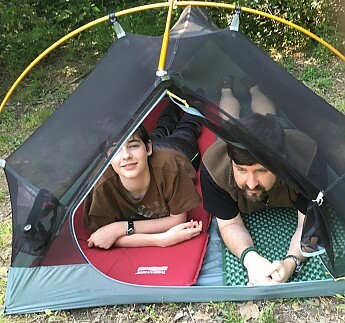 Or, as a fellow Review Corps member put it (thank you, Patman), if you are among "those that hike more than they camp," you might find this a viable ultralight option. It certainly offers a lightweight option for three-season use despite some interior space limitations. 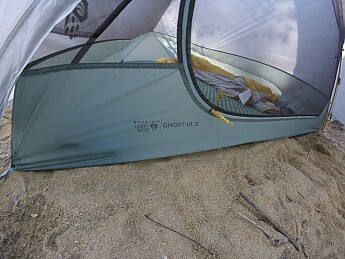 The Ghost UL 2 is a relatively generous one-person tent with an awkward door, but the interior shrinks considerably with two people in it. The would-be purchaser should ponder what living would be like in the comparatively close confines of such a tent if he or she is accustomed to more spacious accommodations. Yes, the Ghost UL 2 can accommodate two adults. Owing to its dimensions, though, two-person use poses unique challenges. Significant movement or shifting of sleep systems, etc. within the tent requires good communication between tentmates. 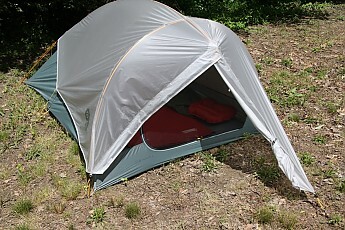 Sleep pads overlap at the foot end, while the shoulder end of the tent offers more space for upper torso movement. Getting dressed (pulling on long pants, for instance) requires the usual in-tent contortions, but this is exacerbated by the presence of a second body in the tent. This is familiar territory for some campers, but I’d recommend crawling inside a display model if you’re not accustomed to the more intimate interiors of ultralight tents. Another potential compromise is long-term durability of materials. In general, I don't expect ultralight materials to have the same level of durability as heavier materials. Personally, I would purchase such a tent with this assumption in mind. To be clear: the materials from which the UL 2 are made seem to be very good quality; nevertheless, they are also lightweight. 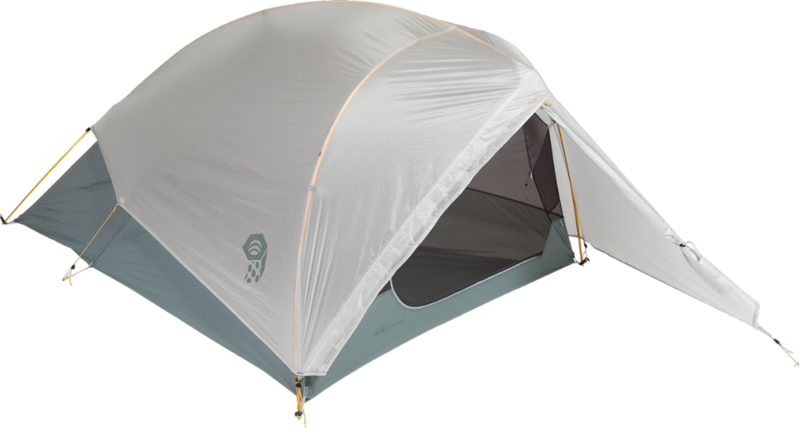 Having tested the UL 2, I would not be inclined to subject its light materials to extended basecamp-style camping expeditions after my experience with the fabric discoloration. Roominess and extended use considerations aside, the Mountain Hardware Ghost UL 2 is a weatherproof tent with a low packed weight and size, quick setup, and nice design touches. One might wish it to have more interior room or a larger vestibule, but its low weight and speedy setup may make these inconveniences perfectly acceptable to an ultralight backpacker. 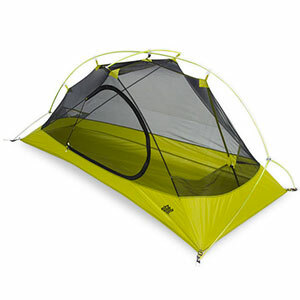 Great review of this tent, Bentbrook! Did you end up sleeping with your older or younger son in this tent? Thank you, Alicia. I slept with both on different occasions. My elder is bigger, but tosses around less in his sleep. Tossing isn't great in a tent this size. Wow, what a good and thorough review. Nice job and thank you for being so meticulous in your descriptions and methods. Impressive indeed. Just one clarification is needed. Freestanding is a term used to describe a tent that can be Set-Up without staking it out. Since ALL tents need to use guy lines for optimal stability in wind or rain, the fact that you need stakes to optimize the performance of the fly does not mean the tent is not 'truly freestanding' (it was designed that way). 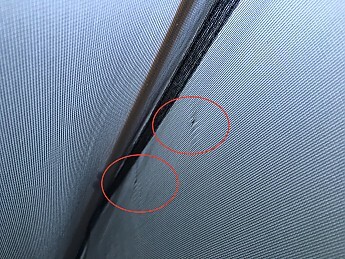 All tents need to be staked out whether you have the fly on or not, otherwise they can simply blow away in even a light breeze and that almost always results in damage. Thank you, Roger, for the technical clarification. You're quite right when one thinks of those tents requiring trekking poles or stakes to give form; I guess I was thinking about the vestibule, which would just be floppy fabric without the stake to give it form, since that in turn would complicate ingress and egress, but--of course--there are other manufacturers who make the same claim whose tents also have vestibules that need staking. I certainly see what you mean. Awesome review man, well done. As for the freestanding issue, it seems you and I think similarly, see my review for the Sierra Designs Flash (I had the same issues as youm same person thought the contrary as well). Thank you, Jake! I do think semantics are important, both for manufacturers and retailers and for consumers. I think the most important thing here is for prospective buyers to understand the nature of the tent, whatever one terms it.